Stacy Tilton Reviews: Coming soon: The Nut Job! Coming soon: The Nut Job! In support of Universal Home Entertainment’s release of The Nut Job, here are some amazing squirrel facts that are sure to blow your mind. Get to know the adorable, furry little creatures before you watch the film – available on Digital HD April 8th and on Blu-ray & DVD April 15th. • There are 365 species of squirrel found all over the world, except in Antarctica, where there are none. • Squirrels belong to the animal group Rodentia –the same as mice and rats. • Squirrels’ sweat glands are located on their feet. • Squirrels can run as fast as 20mph. • Flying squirrels don’t actually fly – they glide. • Squirrels only mate twice a year. • Gray squirrels are often referred to as “living fossils” because they haven’t changed much in their 37million years of existence. • Squirrels are born blind. • Chipmunks are actually small squirrels with stripes. • The squirrel is the Native American symbol for preparation, trust, and thriftiness. If you didn't get a chance to catch this movie in theaters you'll definitely want to jump on board when it's available for purchase. It's guaranteed to make you laugh (well, at least in my opinion it is). We got an advanced copy last week and I thought it was hilarious. Of course I'm a person that just can't get enough of Scrat from the Ice Age movies. Every time he came on screen I immediately focused my attention to see what he was going to do next. So when I heard about The Nut Job movie I couldn't wait to watch it too. 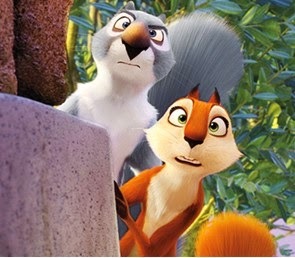 And as luck would have it I found myself laughing once again at the crazy stuff Surly (the squirrel in The Nut Job) did throughout the movie. Here are a few fun activities to keep you busy until tomorrow when you can come back here and enter to win a copy of The Nut Job on Blu-Ray and DVD! Disclosure: Thanks to PR Firm/sponsor I was provided a copy of this DVD in exchange for my posting about the DVD. Any thoughts or opinions expressed are my own. No other form of compensation was exchanged.